Before using the laundry service, please read the following general terms and conditions of service that are part of your laundry contract. There is a strict ban on the introduction of animals, the smoking of tobacco products (including electronic products) and the consumption of alcoholic products. The clients of Speed Queen self-service laundry perform the service on their own responsibility. On their own they decideabout detergent usage, temperature and program selection in washing machines and dryers, the payment system etc. The Speed Queen laundry service is not liable for damages resulting from faulty maintenance information provided by the manufacturer on the product. It also does not respond to the peeling of the material from the stiffening layer, e.g.interlining, shoulder pads, damage to the sliders and buttons, and for damage caused by hidden defects and inadequate quality of materials from which laundry items are made. Laundry is not liable for damage to clothing that could not have been anticipated prior to washing or drying, resulting from insufficient coloring, printed inscriptions, material coiling, impregnation and other hidden defects. The Speed Queen laundry service does not guarantee complete removal of stains from items and garments, nor is it responsible for discoloration of fabrics revealed during the wash and caused during use by the customer. Customer may use additional means such as stain removers and bleaches. At the Speed Queen laundry service, it is forbidden to wash animal garments and animal beds, mops, shoes and objects with sharp metal parts, such as rucksacks. For justified reasons, staff at the Laundry Service Speed Queen have the right to refuse service. The Speed Queen laundry service is not responsible for loss or destruction of washed and drieditems caused by the fault of customer, who did not ensure the time of washing or drying, improperly selected the temperature and wrongly chose the program. When choosing a program and starting the START button, it is not possible to change the washing program. It is permissible that when the client after the service has not removed the item from the device, the new client can remove the items of the previous client to load and start the device. The baskets in the laundry servicecan only be used inside the laundry service. They are owned by the laundry service and cannot be carried outside. The service fee is charged in advance through the electronic payment system. The fee is determined by the price list of the Speed Queen laundry service. Payments for the service can be made in Polish zloty using a card or cash. A receipt or invoice confirms payment for services rendered by the client ofthe Speed Queen laundry service. The laundry service is not responsible for items left in the premises. After 30 days, the items left are decommissioned or donated to charity. The client, while at the Speed Queen laundry service, automatically agrees to video surveillance used in the premises. The client performing laundry service at the Speed Queen laundry service confirms the familiarization with the regulations. SpeedQueen.Club Sp. z o.o. pages can use two types of cookies - session cookies and permanent cookies. The former remain on your device only during use. Permanent cookies remain on your device for as long as their shelf life is set or until you delete them. Yes, using SpeedQueen.Club Sp. z o.o. pages you may receive cookies from third parties cooperating with SpeedQueen.Club Sp. z o.o., such as Google, Facebook, Twitter. Most browsers are initially set to accept cookies automatically. However, you can change your browser settings to block cookies - in whole or in part, e.g. only cookies from third parties, or to receive a message each time cookies are being sent to your device. Remember, however, that if you block cookies used by us, it may adversely affect the convenience of using SpeedQueen.Club Sp. z o.o. websites, for example, you might not be able to visit certain website areas. You will also prevent us from collecting anonymous information about how our websites are used, in order to continuously improve their content. Washing machines have 10 washing programs. To make your choice easier, we provide below table with information on what type of fabric should be washed using this program. Always check this information with description on the label of each thing you put into the washing machine. Important! - it is forbidden to wash accessories for animals, clothes with animal hair and various grease stains! There are one dryer with 10 kg capacity and four dryers with heat pump with 15 kg capacity in our laundry. The selection of drying temperature depends on the type of fabric. How to use self-service laundry? do not load the washing machine with clothes which have a large amount of dirt, clay, glue, gypsum, etc. The world leader of laundry network Speed Queen is already in Krakow. Speed Queen self-service laundry is a comfort, saving time and money! 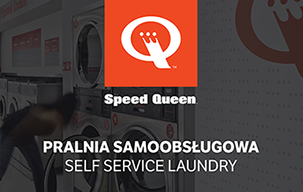 Speed Queen self-service laundry means out of the ordinary atmosphere in laundry and around it, convenient parking and infrastructure - shops, restaurants and free Wi-Fi. Speed Queen self-service laundry is a professional industrial equipment, excellent quality of detergents, nice design, sterile conditions and good atmosphere. We wash in water - this is the safest process for clothes, people and environment (so-called wet washing). Thanks to us, you will save time: the cycle of washing and drying lasts on average 1.5 hours. We provide you with 7 washing machines and 5 modern dryers. Speed Queen washing machines are industrial, sterile due to professional washing programs and fast due to a special drum ensuring excellent quality for every use. We dry without creasing and shrinking, however, you should load the dryer to a maximum of half volume and choose the same drying temperature or higher by 10 degrees than washing temperature. Speed Queen dryers are innovative equipment due to use of the heat pumps; they dry delicately, without creasing and damaging the fabrics. Important! - dryers do not squeeze out water from clothes. You should put into the dryer only well squeezed clothes. We provide washing powder + rinse in our laundry - this is a set of professional detergents used in hotel laundries, hospital laundries, large wash-houses. Washing powder is made on the basis of soda and soap, odor free, so it is safe for humans and does not cause allergic reactions. Rinse is featured by an intense, pleasant and long-lasting aroma, as well as an effective formula that is activated during movement and friction of clothes. Important! - You may use your own detergents. The smallest machine designed for a small number of things. A medium-sized machine designed for the average number of things. A large washing machine designed for a great number of things or larger things. A giant washing machine designed for a very large number of things or large-size things. A medium-sized dryer designed for drying a small or average number of things. A large dryer designed for drying a great number of things or large-size things. Set includes professional washing powder and rinse. The payment system gives out the odd money only in small change. If you choose a loyalty card you'll get exclusive comfort of our payment system service. The card saves time; there is no need for cash and credit card; the card can be used by a third party, and you can also wash more things for less money! Card has no time limit. You can buy the card in payment terminal in the laundry. Important! You can buy and replenish your card in cash only! We invite gyms, fitness clubs, public catering enterprises, hotels, hostels, apartment owners to cooperate with us. The terms of cooperation and the amount of discounts are set individually. © 2018 SpeedQueen.Club Sp. z o.o. All Rights Reserved.